Peel and chop all the fruits you have available except the blackberries and arrange them or layer them in an attractive dessert or ice cream dish. Place 2 cups of frozen blackberries in your blender. Sweeten with honey, stevia or raw sugar. Blend until smooth using only a tiny bit of water. Pour Blackberry sauce over your fruit salad, add seeds nuts or dried fruits, and enjoy this as a salad or main dish anytime of day. Expand your possibilities with a fruit salad bar and experiment with toppings. 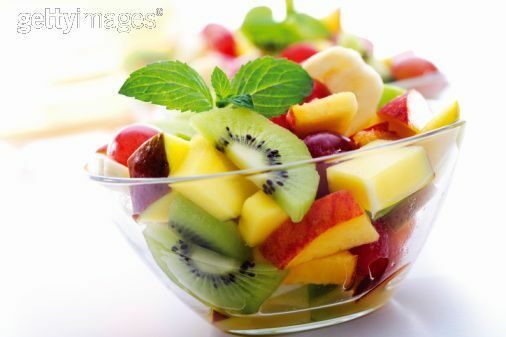 Fruits (start with at least 3): papaya, pineapple, kiwi, grapes, watermelon, cantaloupe, apples, pears, granadilla, banana, orange, cherries etc..
Toppings (one or more): fruit sauces frozen or room temperature like the blackberry sauce above, coconut, honey, dried fruit, sunflower seeds, pumpkin seeds, sesame seeds, yogurt, granola, cookie crumbles etc. – Instead of Apples try strawberries. – In place of peas try avocado. – Any kind of nuts or seeds will do. – Use celery, cucumber, or grated carrot in place of red cabbage. Cut two large stalks of rhubarb in cubes and place in a saucepan. Cover with water and cook until water is used up, and rhubarb has an applesauce-like consistency. Add sugar (1/2 cup or more). Make it a little too sweet to balance the two tablespoons of vinegar you add next. Finish with 4 tablespoons of olive oil. 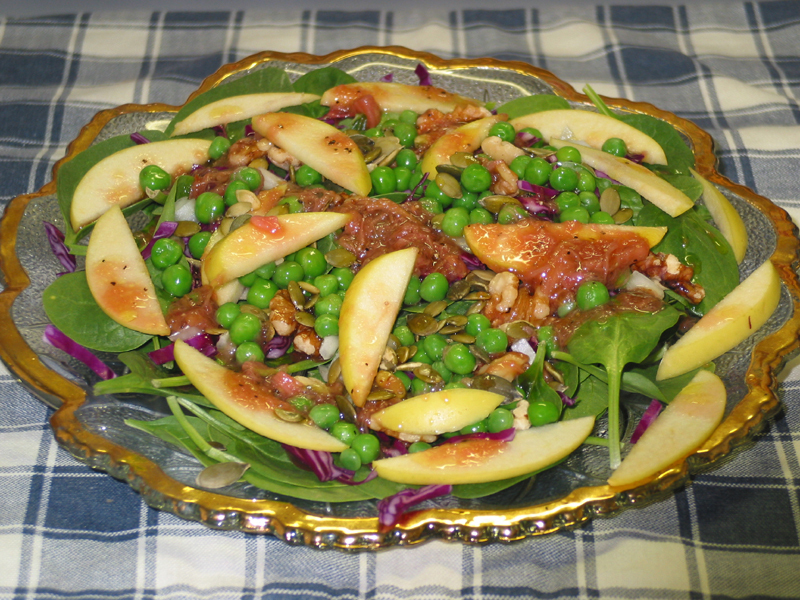 Ground Black Pepper is also very good in this sweet dressing.